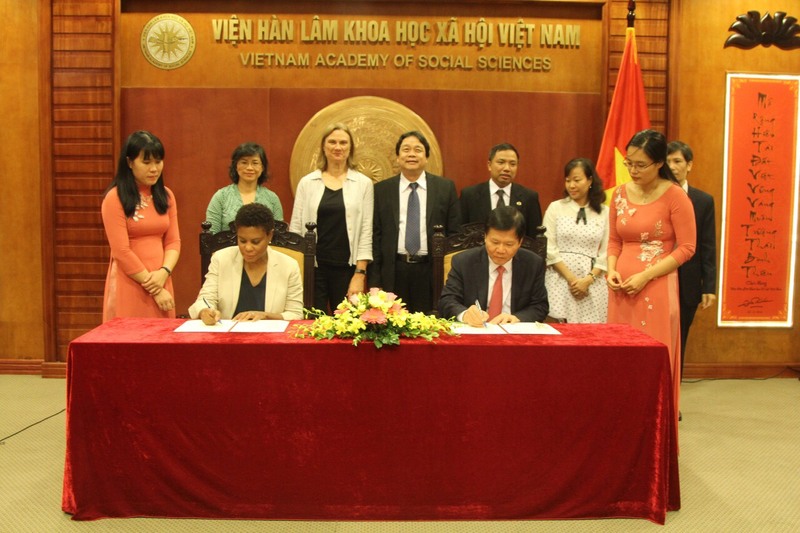 The President of SSRC and the President of the Vietnam Academy of Social Sciences signed a memorandum of understanding to extend over 30 years of collaboration in research, training, and scientific collaboration. Meeting participants: (Seated left to right) Alondra Nelson and Nguyen Quang Thuan. (Standing left to right) Van Tran, Mary McDonnell, Dang Nguyen Anh, Nguyen Thanh Ha, Nguyen Thi Hoai Le, and Nguyen Duc Vinh. 4. Sharing knowledge and data. Professor Thuan thanked SSRC for over 30 years of support and praised highly the effectiveness of the interdisciplinary social research methods training program in advancing the capacity of VASS researchers. The program has been institutionalized within VASS’ Graduate Academy of Social Sciences (GASS), where it continues to be a part of the core curriculum. 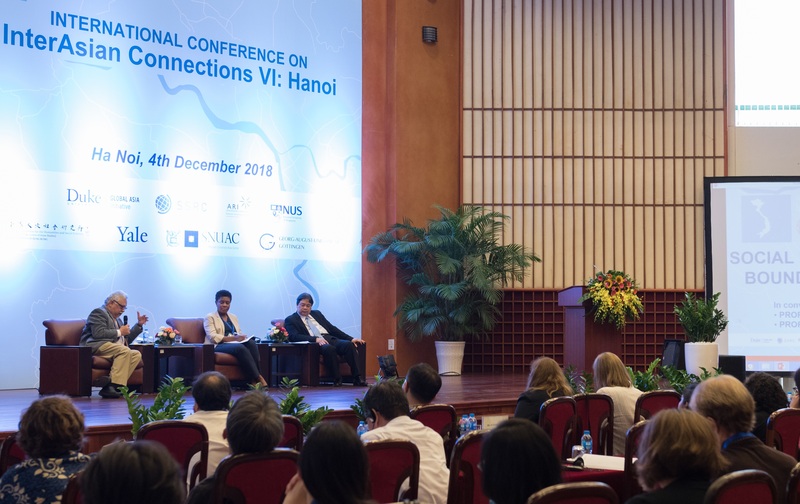 President Alondra Nelson also expressed the Council’s appreciation for VASS’ support over the years and for the excellent hosting of the recent Conference on InterAsian Connections VI in Hanoi, December 4-7, 2018. 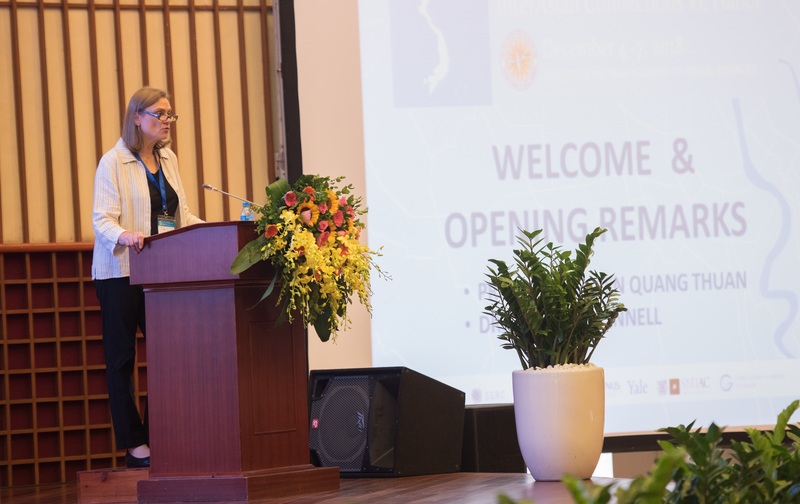 (Left) Dr. Mary McDonnell gives opening remarks at the Conference on InterAsian Connections VI, providing an overview of SSRC's work in Asia and highlighting ongoing work in Vietnam. (Right) Drs. Prasenjit Duara, Alondra Nelson, and Dang Nguyen Anh present in a panel on Social Knowledge and Boundary Crossing. organize the Conference on InterAsian Connections VI in Hanoi (2018). Also present at the ceremony were director and associate director of the SSRC’s Vietnam Program, Mary Byrne McDonnell and Van Bich Thi Tran, and leaders from VASS, including: Professor Dr. Dang Nguyen Anh, Vice President of VASS; Mr. Nguyen Thanh Ha, Director of the International Cooperation Department; Associate Professor Dr. Nguyen Thi Hoai Le, Director of the Scientific Management Department; and Associate Professor Dr. Nguyen Duc Vinh, Director of the Institute of Sociology.